Here at Cruise Nation, we’re a company which proudly provides its customers with wonderful cruises all year round – not just in the summer. We believe that a cruise in the winter can be just as luxurious and enjoyable as one which takes place in the summer. However, as summer is drawing increasingly closer, it could be quite strongly argued that we’re all itching to break out the sun creams and lotions, not to mention indulge in cold refreshments such as ice lollies and the odd chilled alcoholic or carbonated beverage. Anyone who’s ever been on a cruise in the height of summer will tell you how great they are – especially when it comes to sitting out in the sun to catch a few rays and develop an impressive golden tan. Let’s face it, one of the big attractions of summer holidays for many of us is the sun and what it does to the colour of our skin. A good session basking (or is that baking?) in the sun can turn a British milk-bottle-like complexion into an olive-like one in virtually no time. Some of us find that our tan develops right away, whilst others have to be a bit more patient and persevere – we may have to read War and Peace whilst we wait for the sun to do the business on our skin, but we’re more than prepared to do so. Thankfully, the majority of us usually come back off our jollies with a tan of some sort – at least a t-shirt tan – and whether we like to admit it or not, we can’t wait for our family, friends and colleagues to see it. There are few comments a recently-returned holidaymaker dreads more than: “Thought you’d gone on holiday? Where’s your tan?” Eight truly crushing words – especially when you’ve been away for a week or longer. Luckily for you, cruise ship decks make for ideal tanning stations – there are no surrounding buildings or trees to get in the way or block the sun for any extended period of time. It’s just a vast open sky which will allow you to get the benefit of the sunshine all day long (or all week or fortnight long if you’re seriously determined to catch a tan). However, it’s all well and good being within the sun’s line of sight, but to be able to truly enjoy the sun-lounging experience you need to have access to a luxurious sun deck which facilitates both comfort and enjoyment. The days of having one cramped and minimalistic deck on which to sunbathe are now thankfully over – many modern cruise ships now have multiple deluxe decks for passengers to choose from, not to mention a variety of swimming pools for those of you who enjoy a splash around (or some genuine exercise). This is partly down to the fact that cruise ships are a lot larger now than they were, say, 20 years ago, but 21st century innovation has also meant that they have become much more exciting and entertaining vessels (not that they were boring before by any means, but you know what we mean – they have advanced greatly!). Here at Cruise Nation we do of course understand that, as a summer cruise ship guest, your tan is very important to you and the process by which you acquire it is equally important, as it will provide you with some much-needed rest and relaxation. For this reason, we intend to give you an insight into three of the most imaginative and luxurious cruise decks we know of. We’ll start off with Royal Caribbean because their enormous cruise ships cater greatly for the sun-lounging and tanning needs of any guest – regardless of their age or tastes. 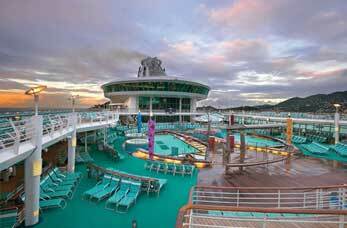 Their Freedom of the Seas and Oasis of the Seas vessels contain the most impressive options. They have a good handful of different pools for you to choose from, all of which are specifically designed and laid out for their individual purposes. Those of you who are keen swimmers who do it for exercise will be delighted to hear that these two ships have pools actually for swimming in them, but not only that, there is another pool for sports such as water volleyball and other such game-like activities. 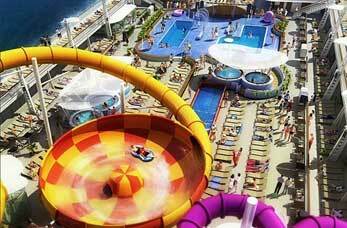 Those of you, on the other hand, who like to relax or horse around in pools, will also find that your needs are catered for on Royal Caribbean cruise ships. 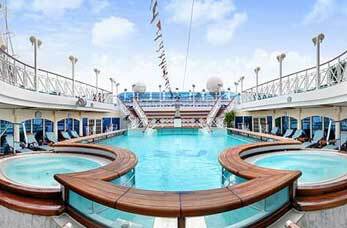 You’ll be able to indulge in a good hot soak in one of the numerous whirlpools, and some ships (such as the Allure and the aforementioned Oasis) have zero-entry pools, which will of course allow you to gradually step in, getting deeper with each stride. One aspect of the Royal Caribbean ships we really like here at Cruise Nation are the child-specific and adult-specific decks. There’s a ‘H2O Zone’, which is for little ones only – it’s not only got a great pool and inviting fountains, but a water cannon as well! You won’t have to worry about going to great lengths to keep your kids occupied on any Royal Caribbean ship – you’ll be able to leave them to it whilst you’re free to sit in the sun and read, sleep or do whatever you like. You’ll most likely find that your children are enjoying themselves so much that they won’t be coming over every ten minutes to eclipse the sun as they ask you something. Don’t worry – there’s also an area for adults which is just as exciting. Instead of water cannons there are cantilevered whirlpools which will allow you to take in breathtaking views of the ocean as you’re in them (they hang over the side of the ship). There are also hammocks and swinging chairs for those of you who’d like an alternative furniture option to the standard sun-lounger set-up. Around the middle of most Princess cruise ships is the Calypso Reef area, which contains a number of swimming pools ranging in size, as well as a number of hot tubs. There are pools for serious swimming and ones for having a laugh and a joke in – and of course the hot tubs on top of these provide an extra relaxation option (and a highly popular one, as you would imagine). Even during winter and unfavourable weather conditions you’ll be able to enjoy yourself in the Calypso Reef area – there’s a roof made out of sliding glass which will come into play and allow you to continue enjoying the pool and the surrounding facilities. Speaking of which – we almost forgot to mention – there’s a bar too! There are few more enjoyable simple luxuries than sitting in the sun and enjoying a good beverage or two, and you can bet your bottom dollar that you can do just this on a Princess cruise. Now, those of you who are keen filmgoers – or even just enjoy a good movie now and then – will be blown away by what we’re about to tell you… The vast majority of Princess cruise ships now feature a facility known as Movies Under the Stars. Though it’s probably fairly self-explanatory, you can basically enjoy a film whilst out on deck at night (here’s a video). Let us assure you, this is the perfect nighttime activity, and one which is incredibly unique and memorable. It’s the perfect way to wind down after a long day of tanning and soaking up the sun. Even if you’re not a massive film enthusiast, we’re quite sure you’ll get something out of the Movies Under the Stars experience – it’s something you don’t get the chance to do every day, and the backdrop of the night sky mimics the darkness of an actual cinema. We can’t really describe it – it’s something you’ve just got to experience for yourself. Whilst the previous two entries (above) have been about cruise lines as opposed to individual ships, this one is about a specific ship – the Norwegian Epic. Now, you may be thinking that the word ‘epic’ has lost a bit of (if not all) meaning over the past few years – many of us now use it to describe things we like which are not of a particularly huge scale or long duration. However, we can assure you that there is no exaggeration or hyperbole here – the Norwegian Epic truly is a mammoth and grandiose cruise ship! With regards to the sun deck specification, you shan’t be disappointed in any way, shape or form – of this we are quite sure. As you would quite rightly expect, it comes with the numerous pools you would expect any cruise ship to have, and even the fountains seem like a standard feature on the Epic, as there are far more head-turning ones than those. There’s an enormous Aqua Park – for both kids and adults – which is made up of a number of impressive slides and other such waterpark attractions. If we had to pick a highlight, we’d probably choose the Epic Plunge (which, again, is aptly-named and not at all exaggerative) – a tube ride which is over 200 feet in length and spins you around in a bowl just before the adventure concludes in a plunge pool. If, on the other hand, you’d like to enjoy a more lowkey sun-lounging and pool-dipping experience, you’ll find it over at the ‘Spice H2O’ area. It’s an area for adults only to ensure that it remains quiet and tranquil at all times, featuring several tiers so that you’ve got a good few options to choose from. In addition to that, the area has a massive outdoor screen for when it becomes an entertainment later on in the evening. Should you require any refreshments at all throughout the day – on any of the Epic’s sun decks – you just have to raise the flag on your lounger, which will prompt one of the friendly and fast members of staff to come over and grab you whatever you like! We hope you’ve enjoyed reading this blog post – we like to produce posts that we think will be of interest to our customers, and try to be topical whenever we can. We thought that, with summer being round the corner, we’d try to offer a bit of insight into some of the ships you’ll enjoy the most – and we hope we’ve done that. Did you enjoy this post? Have you been on any ships we’ve not mentioned which have also had amazing sun decks? If so, please pipe up and let us know in the comments section below! We’d love to hear from you and we want to spread the knowledge wherever we can. If all this talk of sun-lounging, great tans and unrivalled relaxation has whet your cruise appetite, get in touch with us today and we’ll see what sort of deals we can do for you. Here at Cruise Nation we’re passionate about the cruise holiday experience and we think that it’s still a highly underrated way to travel. By booking onto one of the wonderful cruises we can offer you, you’ll open yourself up to a whole new world – quite literally! Cruising is one of the best ways to see our beautiful planet, and it’s a truly deluxe and leisurely experience. As we said earlier, we’d recommend cruising at any time of year, but if it’s your first time you might want to consider trying a summer one first of all. We’re quite sure you’ll take to it right away, so have a look at our cruise deals now and get yourself booked on one this summer!